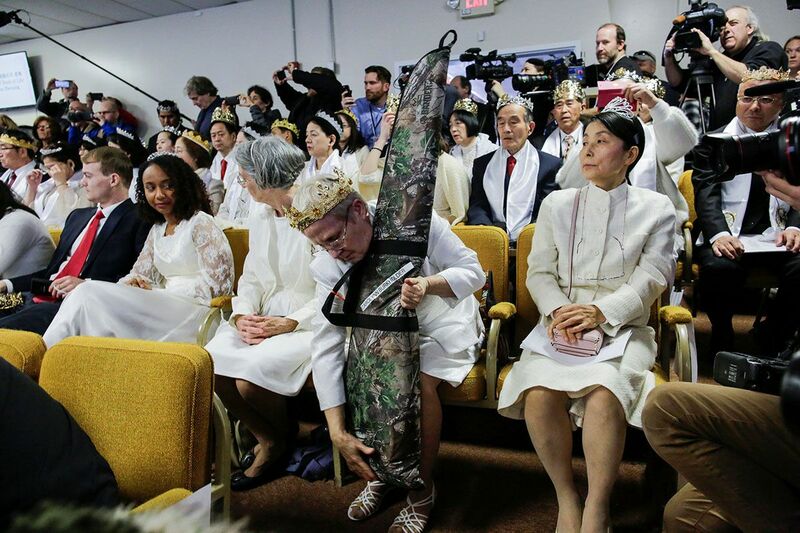 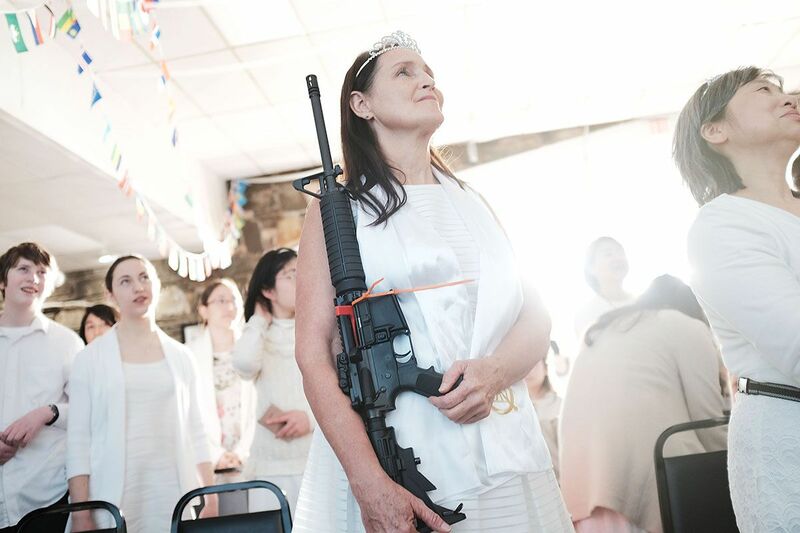 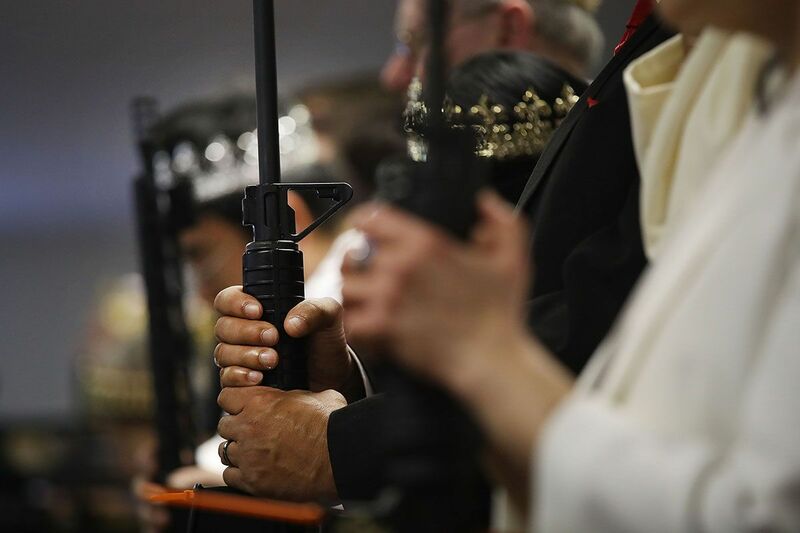 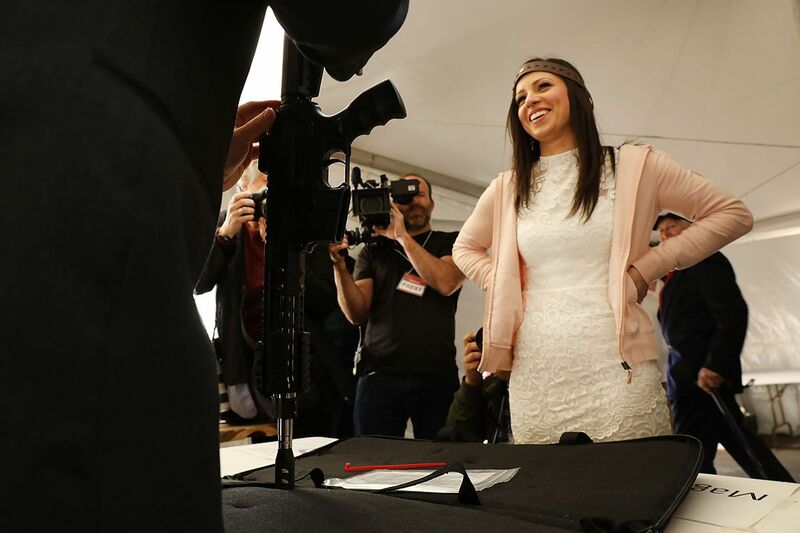 Hundreds of worshippers clutching AR-15 rifles and pistols packed into a church in Pennsylvania to have their weddings blessed and their weapons celebrated as life-saving "rods of iron." 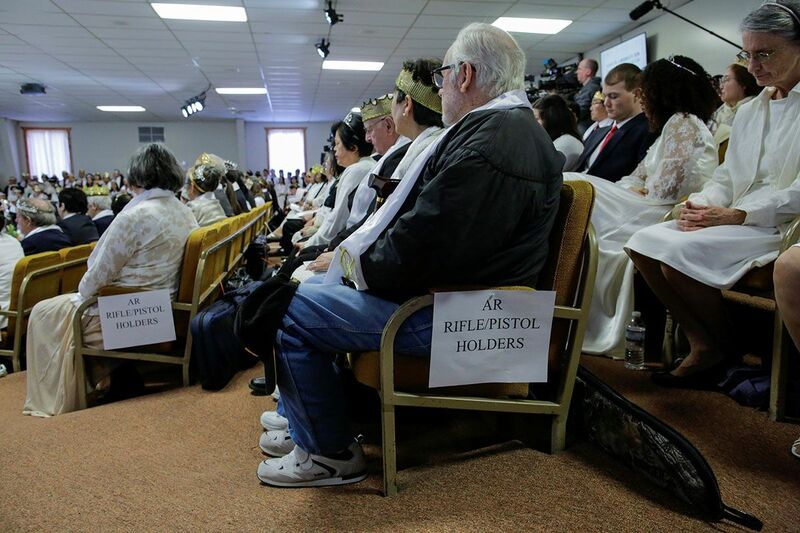 The women wore white bridal gowns and the men wore dark suits as they gripped their unloaded weapons. 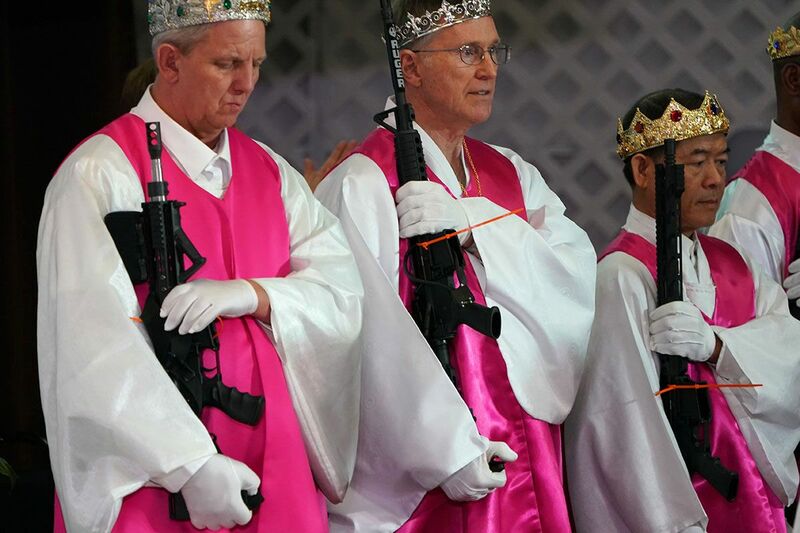 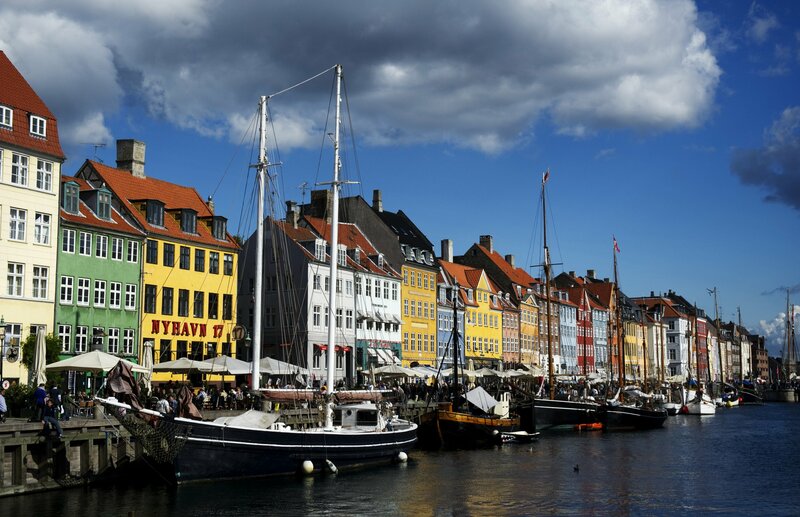 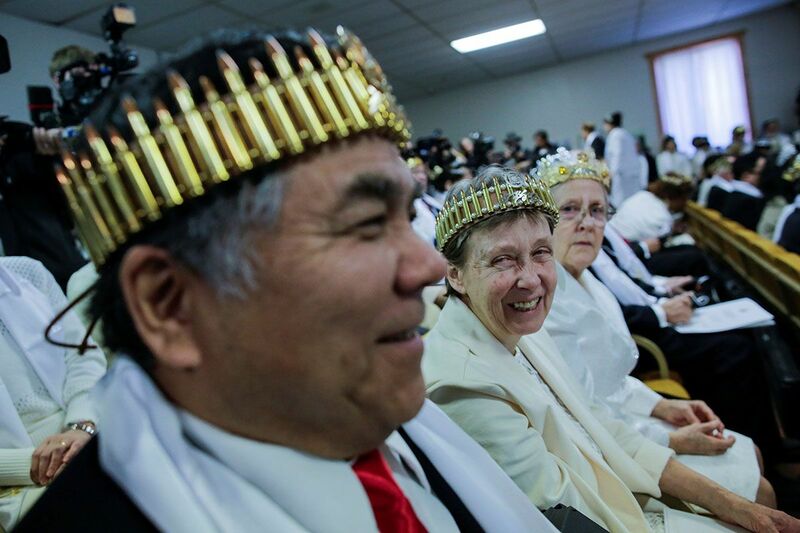 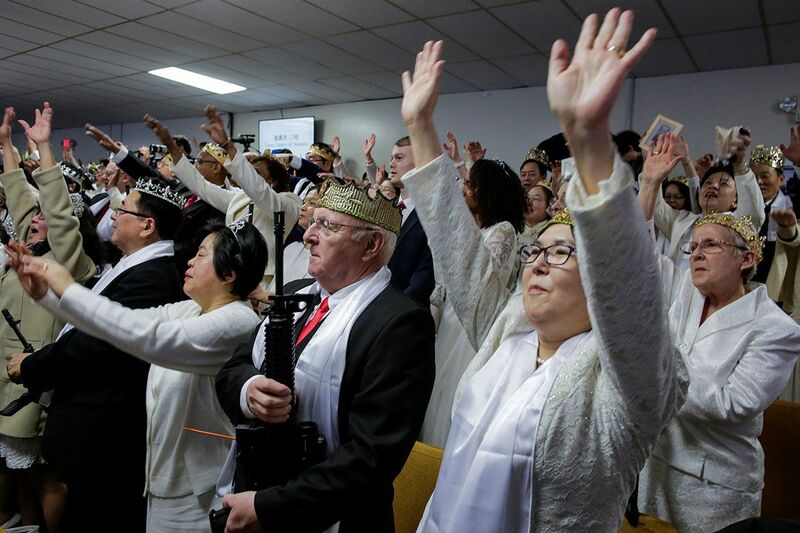 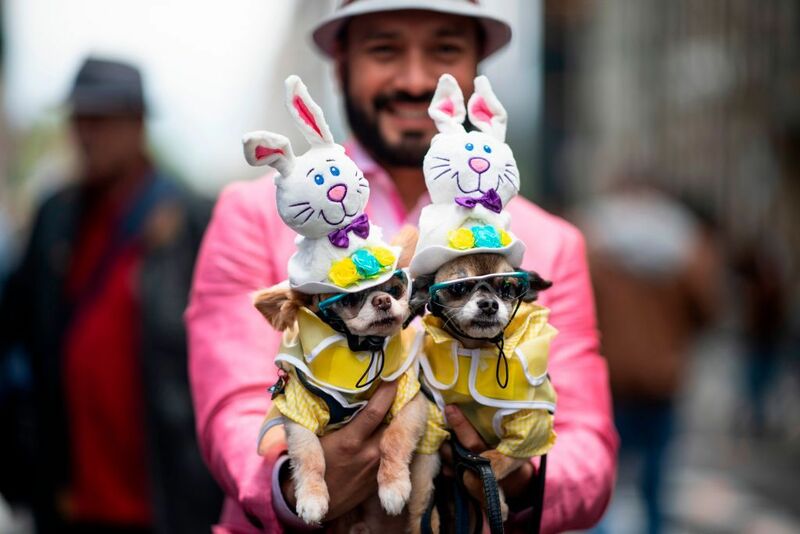 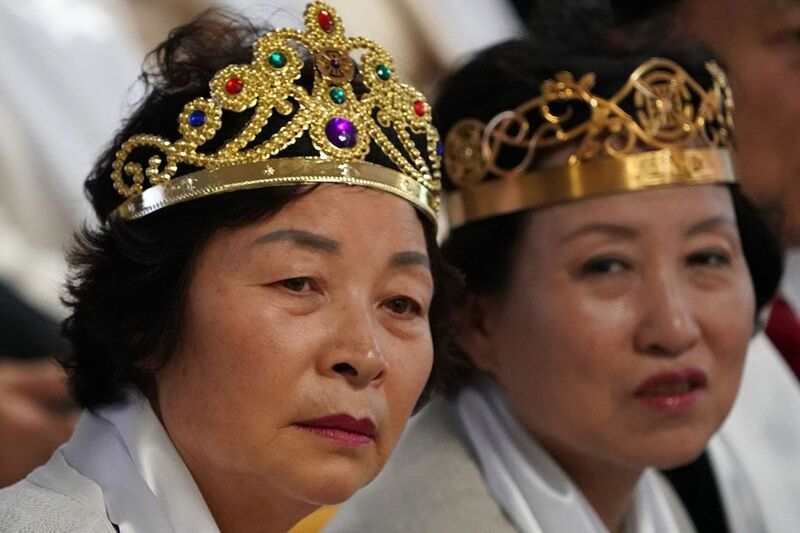 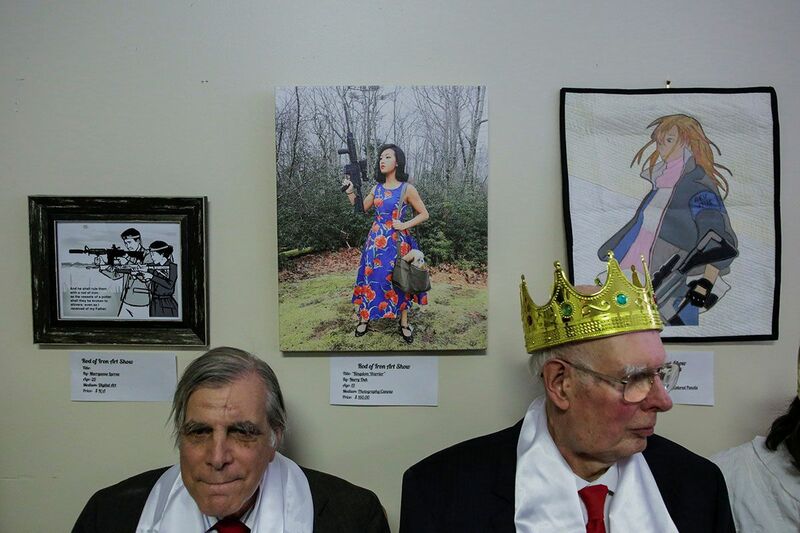 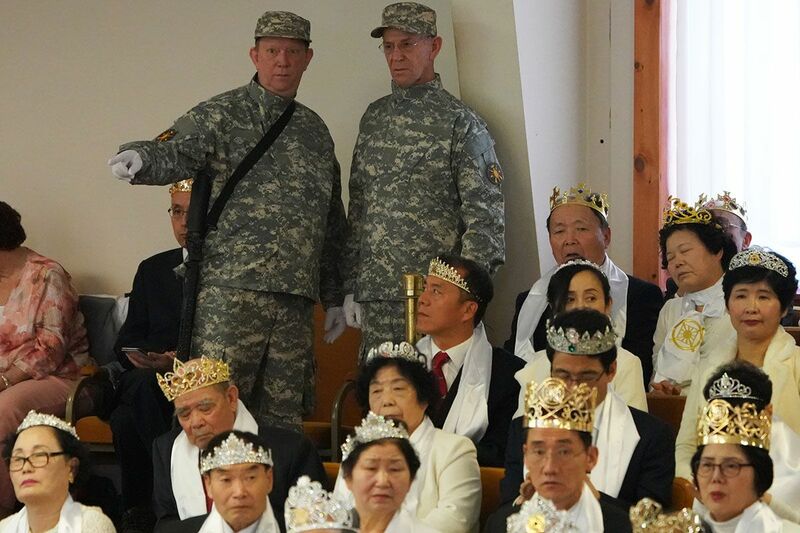 Many wore crowns—some made of bullets—while church officials dressed in flowing bright pink and white garments. 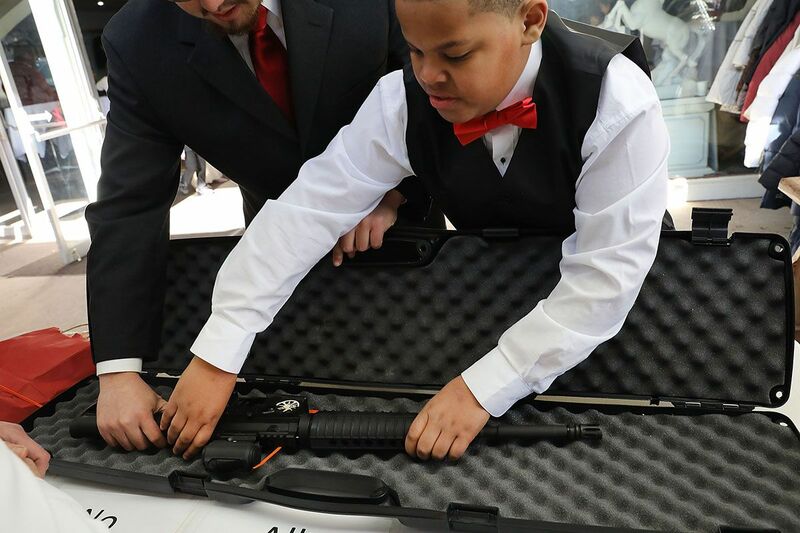 The weapons were checked at the door to make sure they were unloaded, and then secured with zip ties. 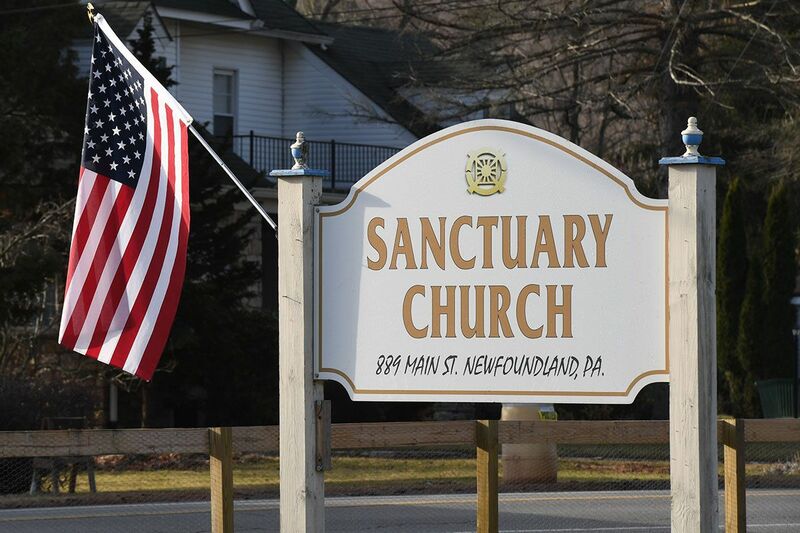 World Peace and Unification Sanctuary is located in Newfoundland in the rural Pocono Mountains, about 100 miles north of Philadelphia. 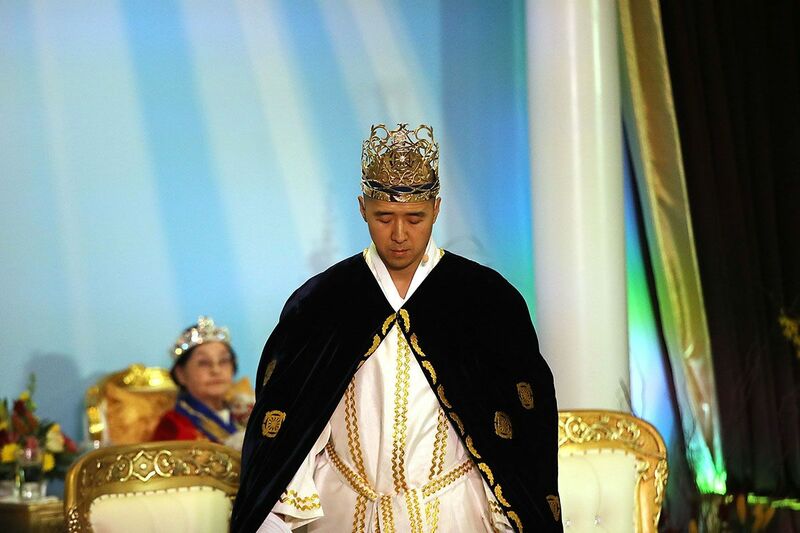 The controversial church is headed by the Reverend Hyung Jin Moon, son of the late Reverend Sun Myung Moon, of "Moonies" fame. 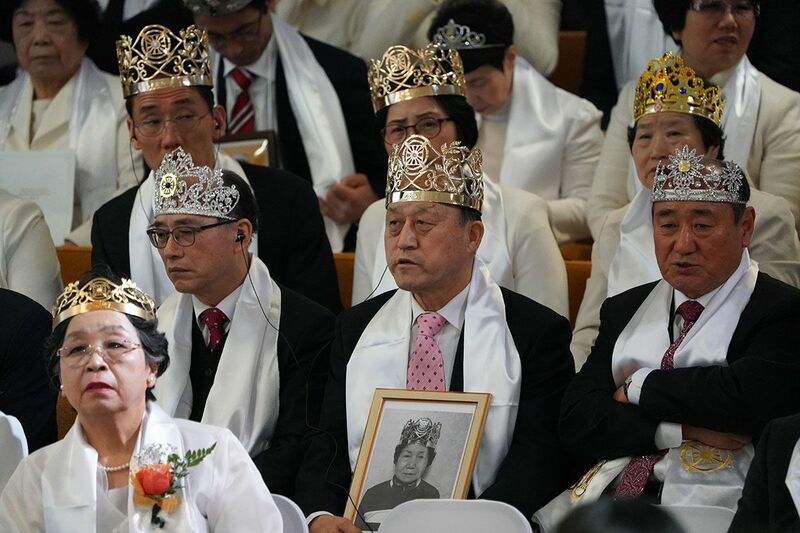 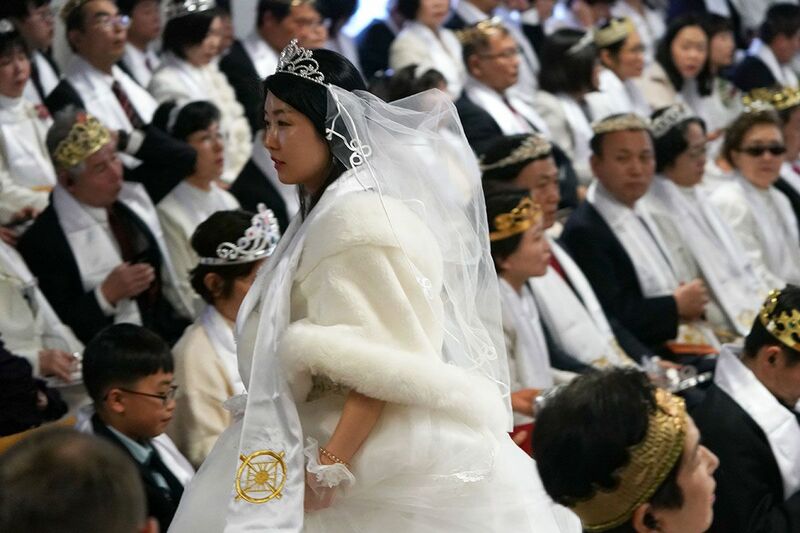 The younger Moon's congregation is a breakaway faction of the Unification Church, which distanced itself from the ceremony. 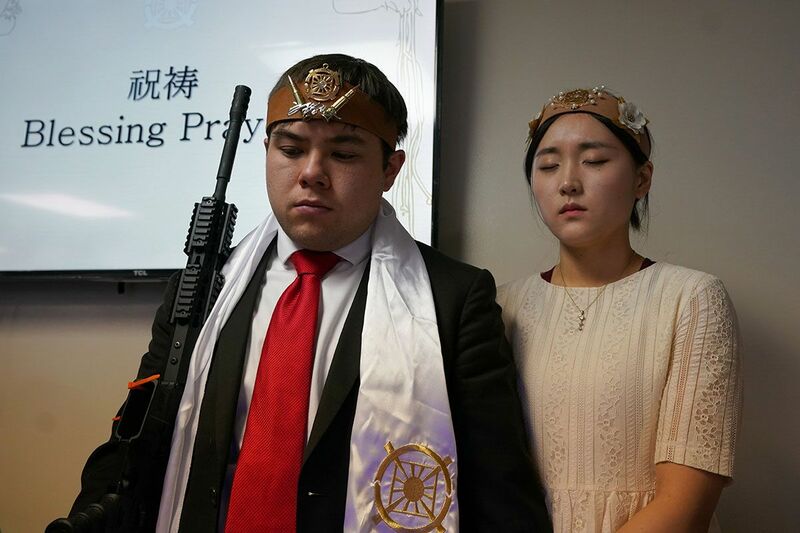 A spokesman for the church said the marriage blessing ceremony had been planned long before a man with an AR-15 massacred 17 people at a school in Parkland, Florida, on February 14. 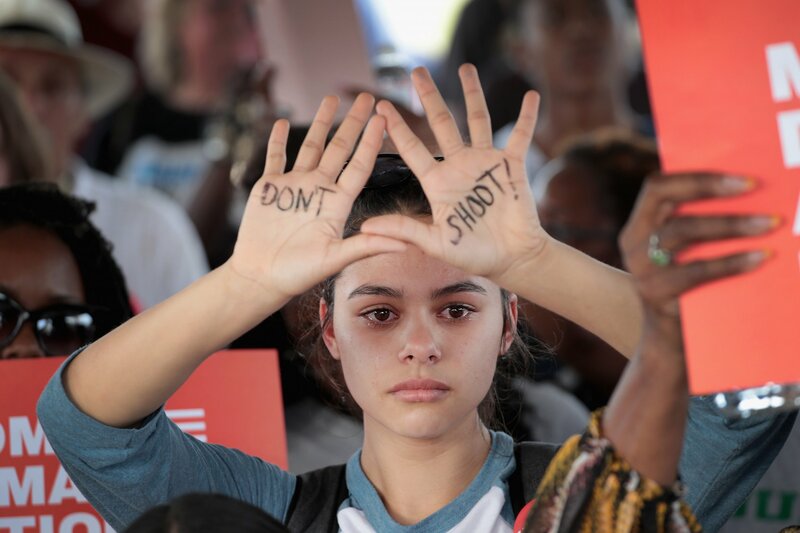 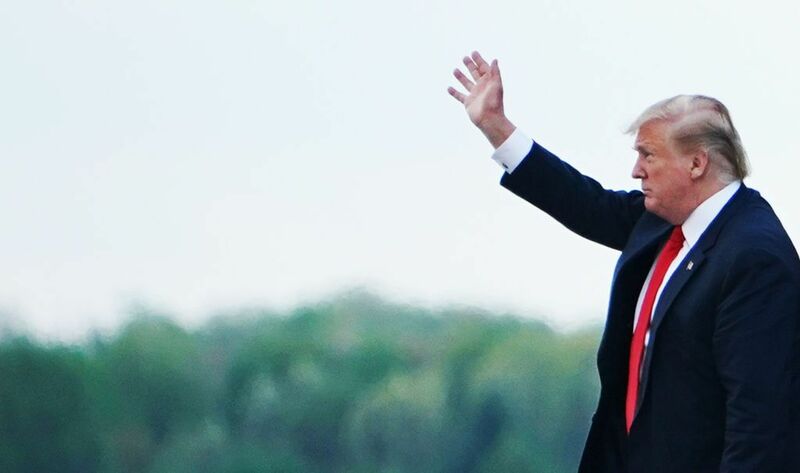 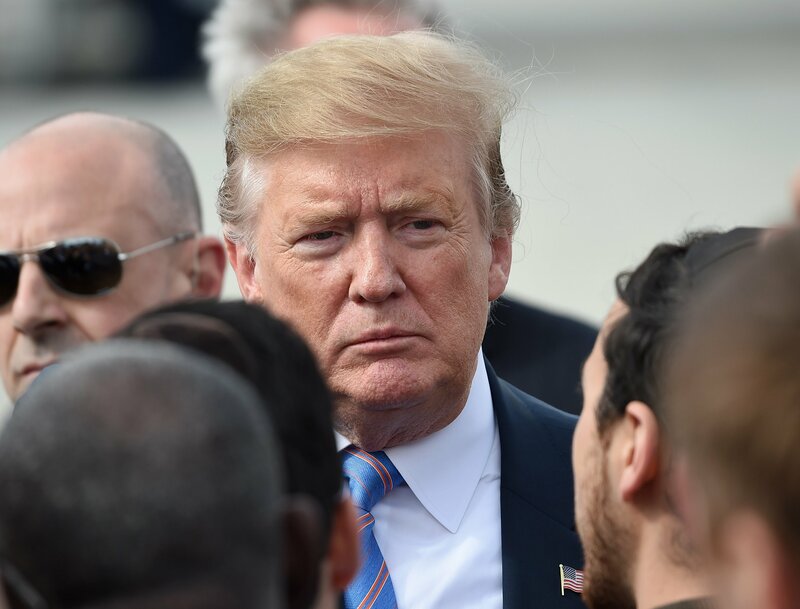 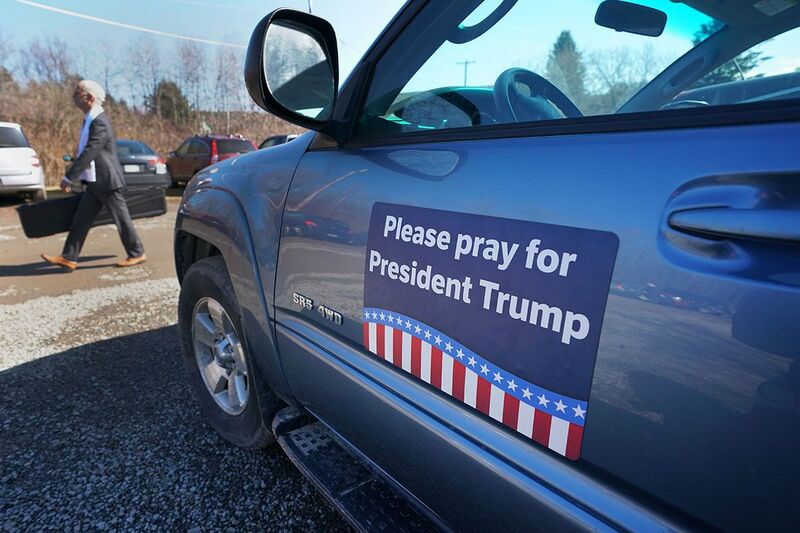 Moon said in a statement that the staff of the Florida school should have been armed, a strategy also put forward by President Donald Trump, despite widespread criticism from teachers. 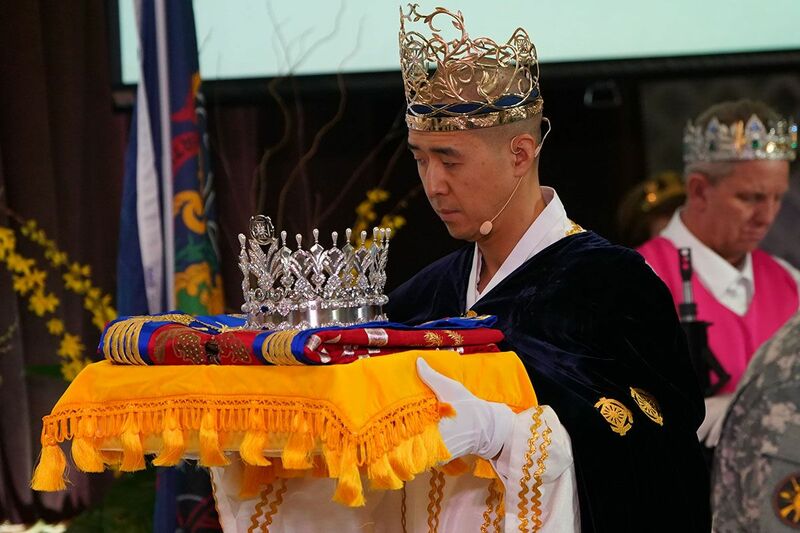 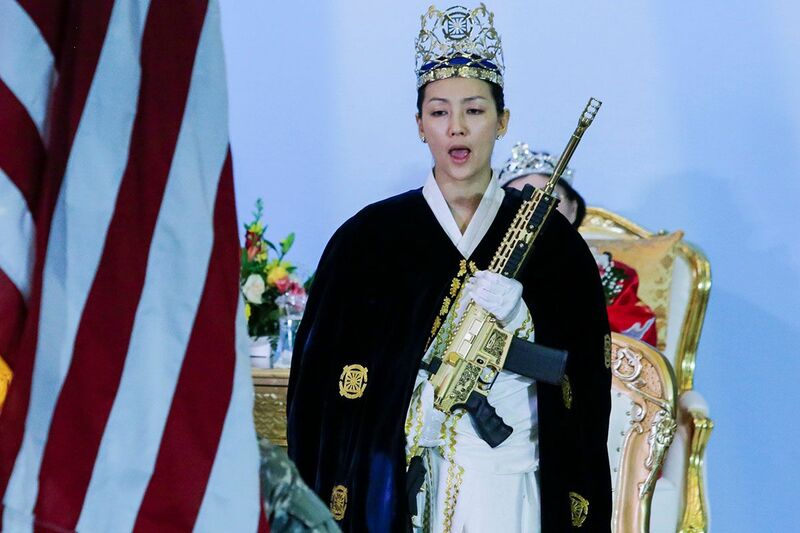 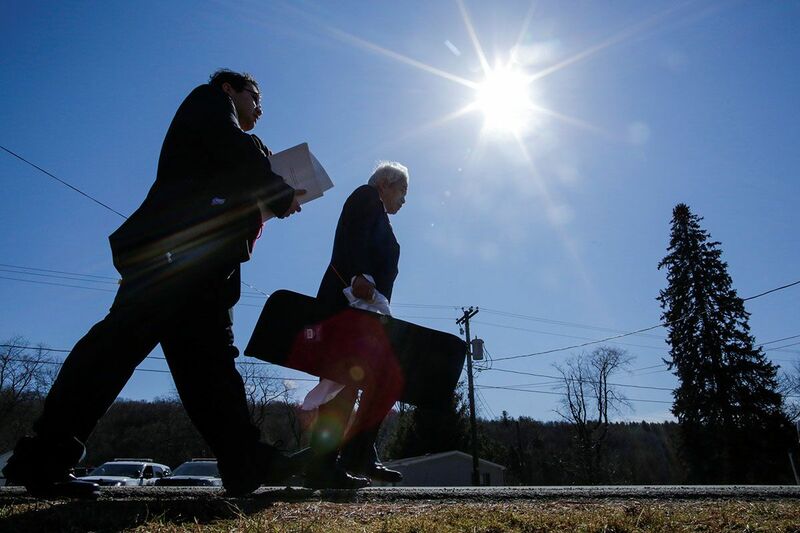 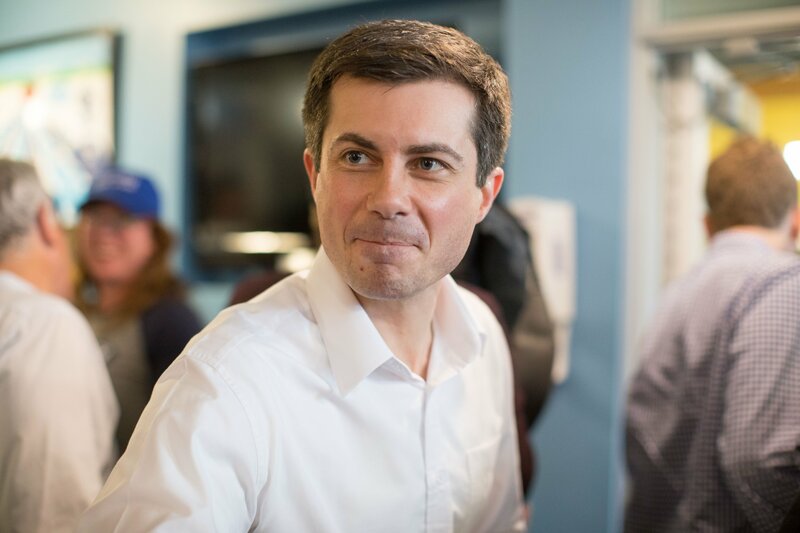 "Each of us is called to use the power of the 'rod of iron' not to arm or oppress as has been done in satanic kingdoms of this world, but to protect God's children," Moon said, citing the Book of Revelation in the Bible. 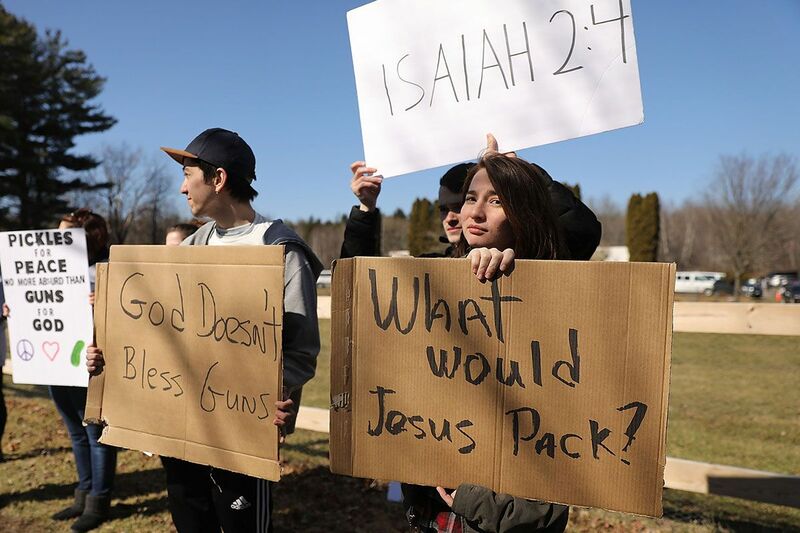 Protesters demonstrated outside the church holding signs that read: “Worship God, not guns” and “What would Jesus pack?”. 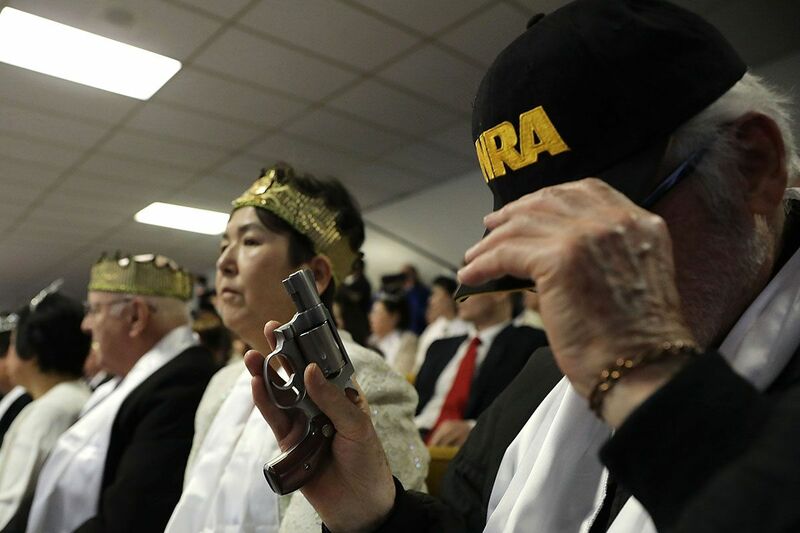 Sreymom Ouk, 41, who attended the ceremony with her husband, Sort Ouk, and their AR-15, told the Associated Press their weapon was for defending her family against "sickos and evil psychopaths." 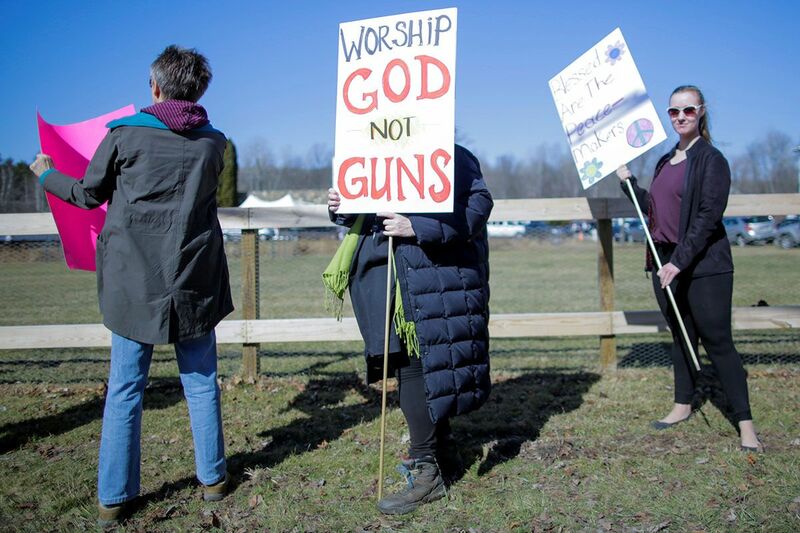 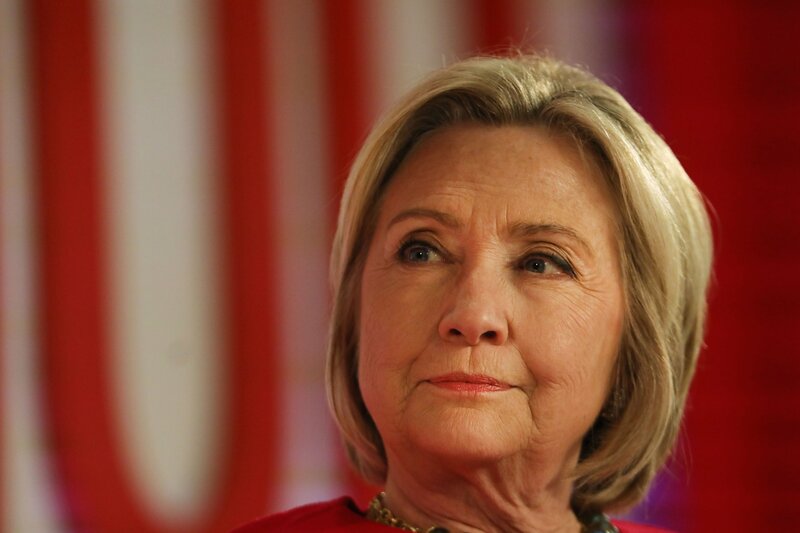 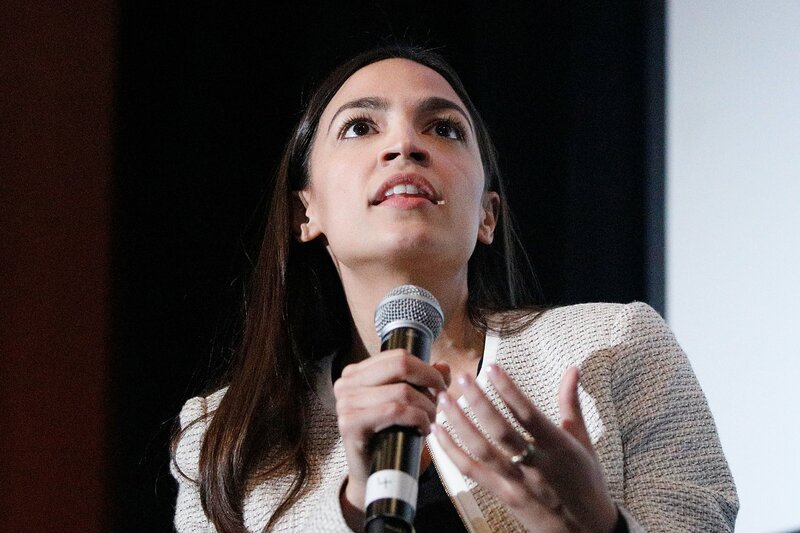 "People have the right to bear arms, and in God's kingdom, you have to protect that," she said. 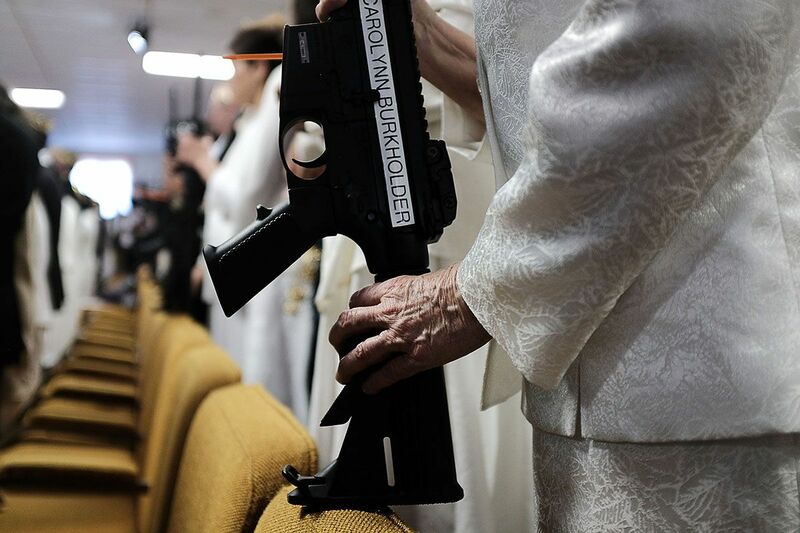 "You have to protect against evil." 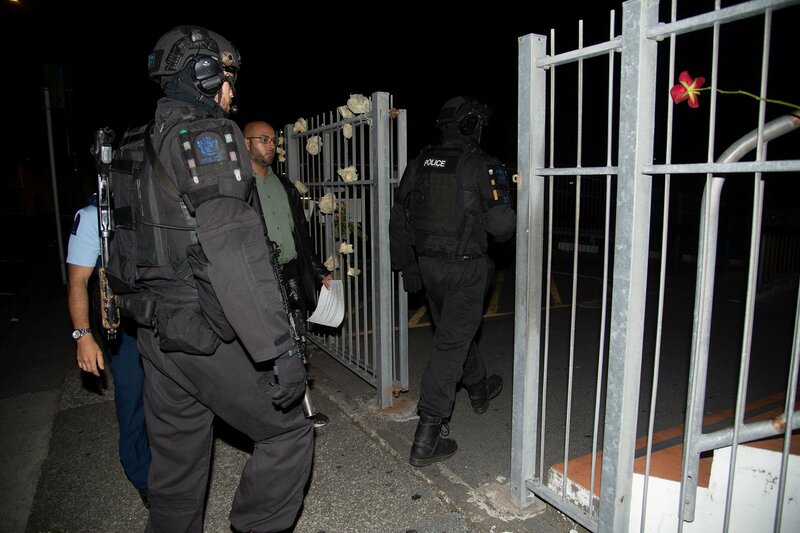 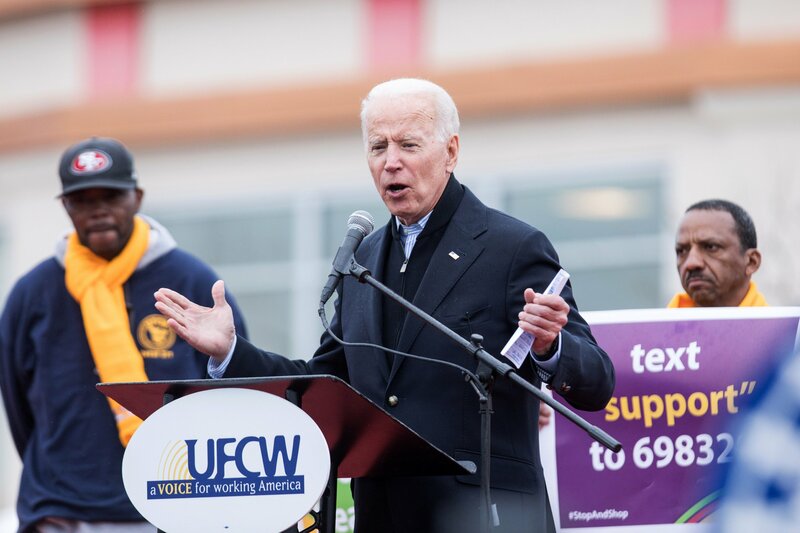 Will New Zealand Attacks Spur U.S. 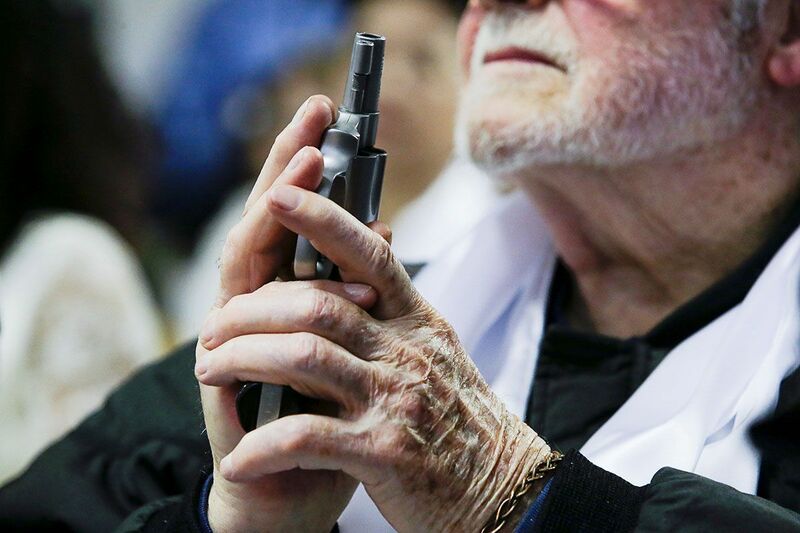 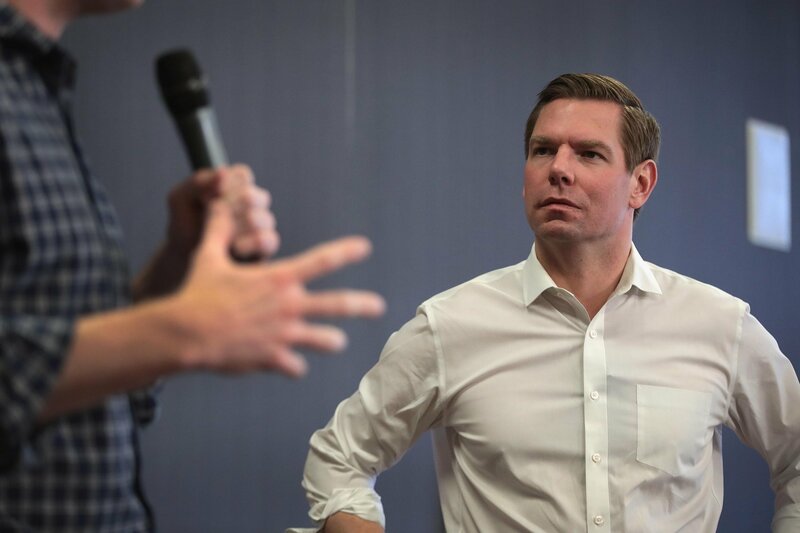 Gun Law Changes?